Case Matrix – Case Store Online – Shipping Cases and more! 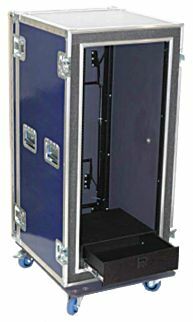 Matrix Shock Rack Mount Shipping Cases have been designed and engineered to provide complete protection for the most sensitive E.I.A. 19″ rack mountable equipment and instrumentation. Rack Rails: Front and rear rack rails are standard. 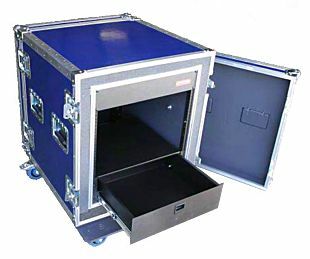 Made from heavy duty 12 ga. steel and tapped with 10-32 holes our Cases provide a precise platform for all 19″ rack mountable equipment and systems. Foam Suspension System: For total shock absorption the case floor section has a 2″ thick high compression Polyethylene Foam and a 2″ thick soft Polyurethane Foam (Ester) on top and all sides. Removable Front & Rear Lids: The Front and Rear Lids are removable for complete access to your electronic equipment from both sides. 1/4″ ABS / Ply 90 Lbs. 1/4″ Fiberglass / Ply 90 Lbs. 3/8″ ABS / Ply 200 Lbs. 3/8″ Fiberglass / Ply 200 Lbs. 1/2″ ABS / Ply 500 Lbs. 1/2″ Fiberglass / Ply 500 Lbs. CASTERS: Fixed and removable casters, 3.50″ diameter wheels. COLORS: Black is the standard Matrix case color. Other colors are available at no extra charge (Blue, Grey, Red, White, Green) but may require longer lead times. Divider Systems: Inner partitions divide heavy loads inside the case, each section will have its own foam cushion system. Tabletop: Container lids convert to a workstation table, assembly set-up requires less than a minute. Sliding Drawers: Fully-enclosed steel chassis or economical Fabricated Drawers for storage of tools and accessories in a rack. Available in three sizes: 2-Space, 3-Space or 4 rack Space. Steel Drawer extends a full 14″ for easy access. Special Non-Rack Mountable: For non-rack mountable equipment, Case Matrix is experienced in designing foam systems for equipment use within the container (Workstations), taking into consideration ventilation of equipment as well as ergonomics. © 2019 Case Matrix – Case Store Online. All rights reserved.